Sweet and Sour Meatballs: tender meatballs simmered in a tangy sweet & sour sauce. Make them in the crockpot or on the stovetop; they’re easy & so delish! I’ve been meaning to share this recipe for sooo long! 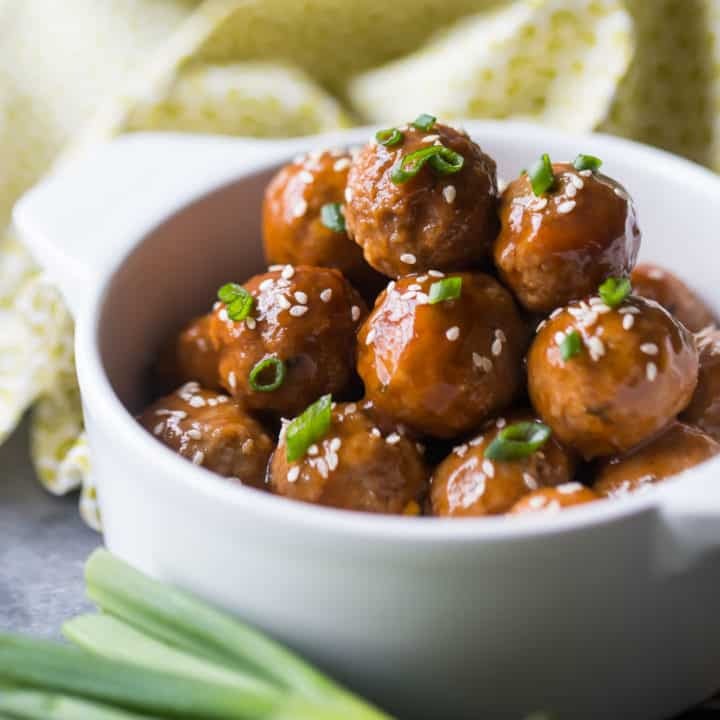 I’m so happy I’ve finally gotten around to it, because these sweet and sour meatballs are seriously delicious and so easy to make. I love them as a party appetizer! Lately I’ve been trying to include more of these types of recipes here on Baking a Moment. We’ve done buffalo chicken dip, spinach artichoke dip, and a really fabulous chili recipe that my family just loves. These kinds of dishes are THE BEST for entertaining. Keep them warm in a crockpot and your guests can graze on them all throughout the party. It’s the same for these meatballs. Just set them out with toothpicks, and everyone will nibble to their hearts content. 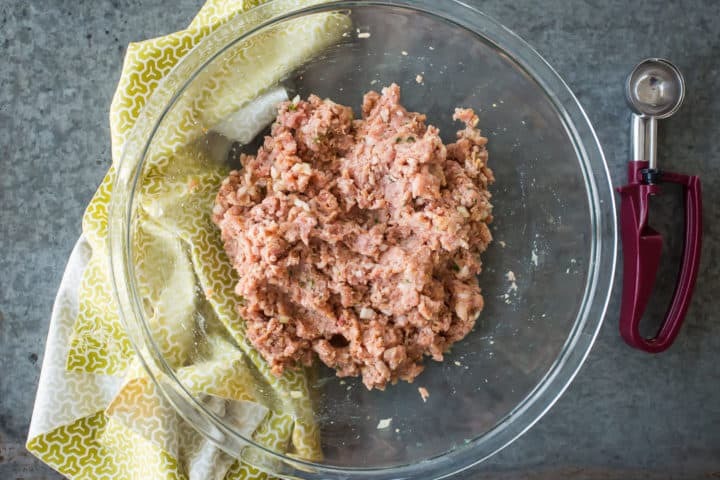 This is a pretty basic meatball recipe that tastes great with just about any kind of sauce. 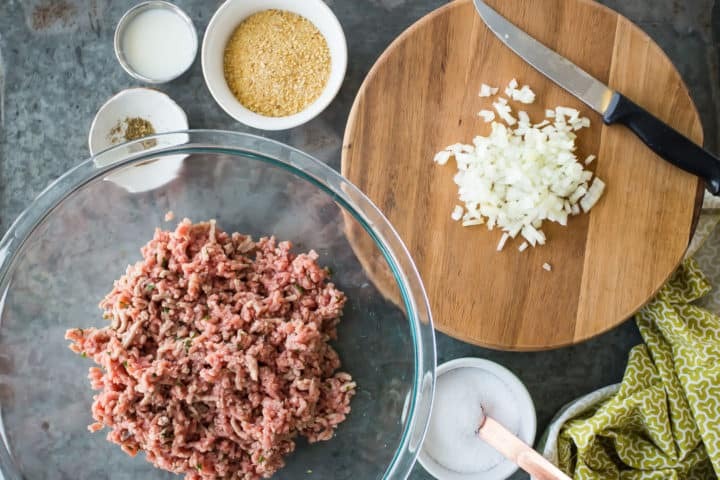 You can use any kind of ground meat you like, but I am partial to what they call “meatloaf mix.” It’s a combination of ground beef, pork, and veal, and it yields a really rich flavor and tender texture. But if you have trouble finding it at your supermarket, just use ground beef or ground turkey instead. Just mix everything together and then roll it into 1-inch balls. I like to portion my meatballs out with a little ice cream scoop. Here’s a link to one similar to what I have. 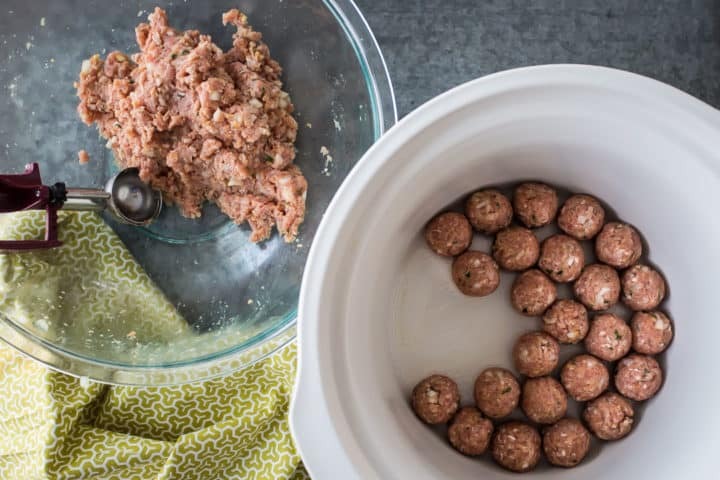 Mist the insert of your crockpot with a little nonstick spray and carefully place your meatballs in an even layer. Then you can get going on the sauce. 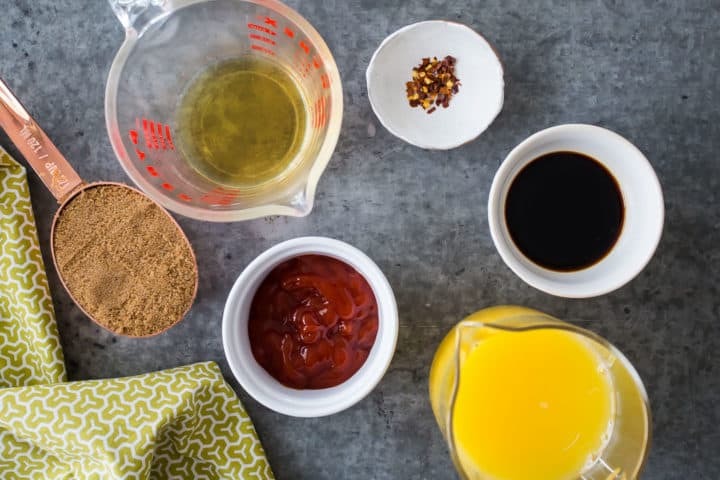 Whisk all of these ingredients together until smooth, and pour the sauce over the meatballs. Let everything simmer away for a few hours. And then about 30 minutes before you’re ready to serve, make your slurry. 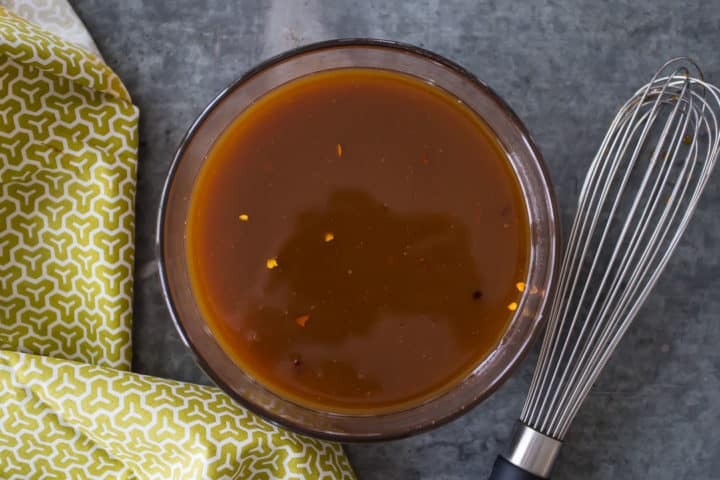 This will thicken the sauce to a sticky, glaze-like consistency. 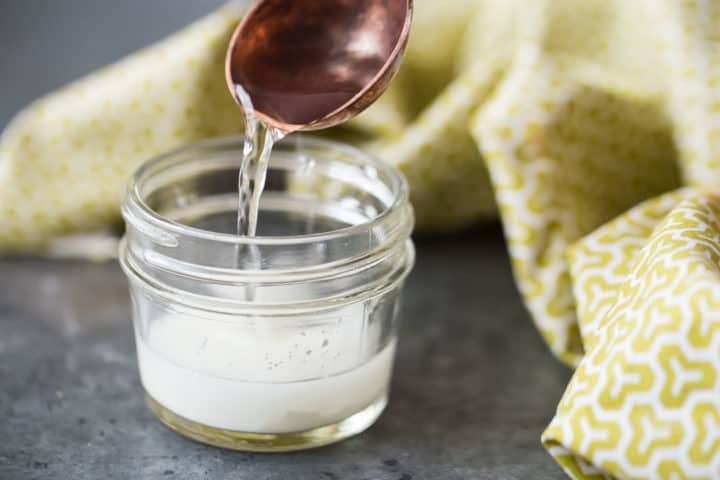 Stir cornstarch and water together to make a slurry, then add that to the sauce. After about thirty more minutes simmering, your meatballs will be glazed in a thick, luscious sweet and sour sauce. CAN THESE BE MADE ON THE STOVETOP? If you don’t have (or don’t want to use) a slow cooker to make these, you can definitely do them on the stovetop instead. Just put them in a heavy-bottomed pot (I’m especially partial to this kind. ), and let them simmer over low heat until they register 165 degrees F on a meat thermometer. 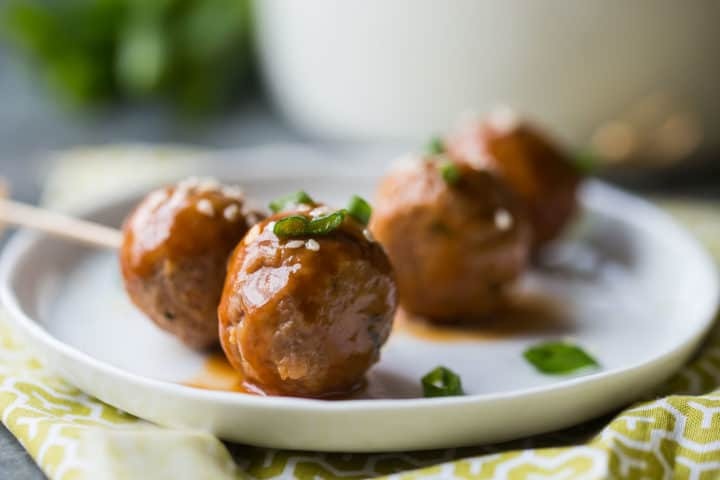 I really like these meatballs as a party appetizer, just garnished with sliced scallions and a little pinch of sesame seeds. Guests can eat them off of toothpicks, so they’re a really great finger food! CAN SWEET & SOUR MEATBALLS BE A MAIN DISH? You can totally make a meal out of these! Serve them over rice or noodles, alongside a nice steamed vegetable like broccoli or green beans. Or you could split a baguette, add some pickled veggies, and tuck a few meatballs inside for the banh mi sandwich of your dreams! CAN SWEET AND SOUR MEATBALLS BE MADE AHEAD? If you’re pinched for time, try making this dish a few days ahead. Then just transfer them to your crockpot (or gently reheat on the stovetop) until warmed through and bubbling. These sweet and sour meatballs can be kept warm in the slow cooker for a few hours. 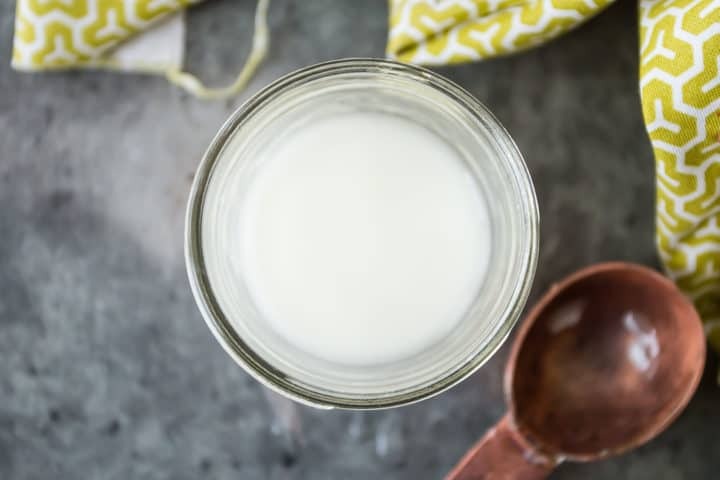 If you have any leftovers, let them come to room temperature, and then transfer them to an airtight container. They’ll keep in the fridge for several days, or in the freezer for a month or two. 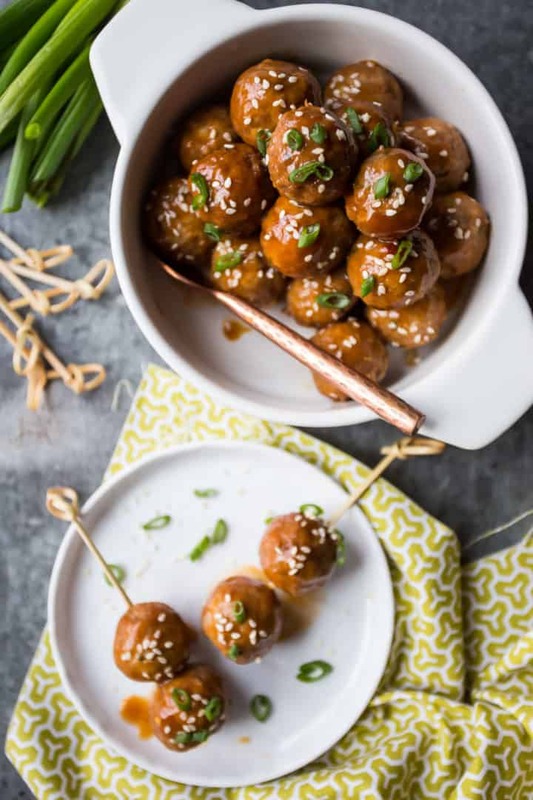 Next time you’ve got something to celebrate, whip up a batch of these tangy sweet and sour meatballs! 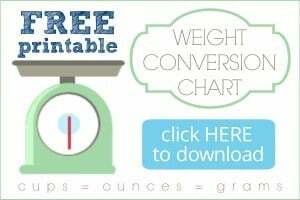 They’re such a fun party app and your guests will love them! Sweet and Sour Meatballs: tender meatballs simmered in a tangy sweet & sour sauce. Make them in the crockpot or on the stovetop; they're easy & so delish! Place the ground meat, bread crumbs, milk, onion, egg, salt, and pepper in a large bowl and stir together until combined. 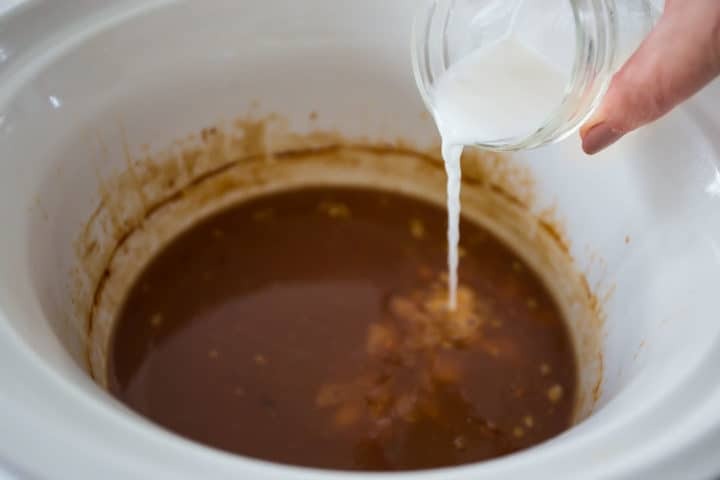 Mist the crock pot insert with non-stick spray, roll 1-tablespoon sized balls of the mixture between your palms, and place in a single layer at the bottom of the slow-cooker. 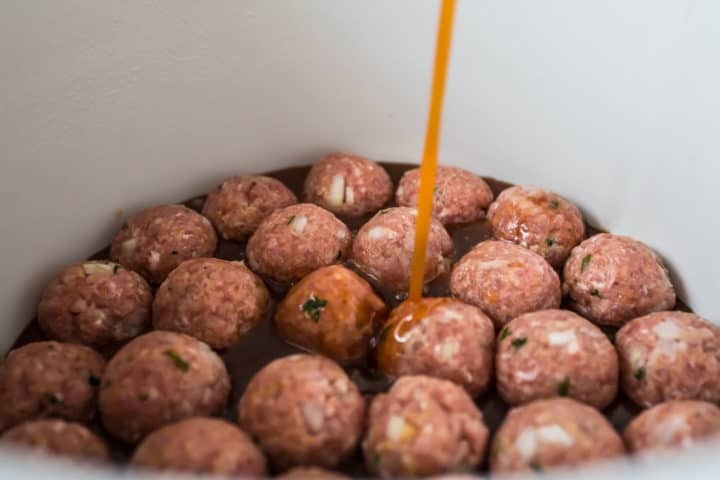 Pour the sweet and sour sauce over the meatballs, and cook (covered) for 1 to 2 hours on high heat, or for 3 to 4 hours on low heat. 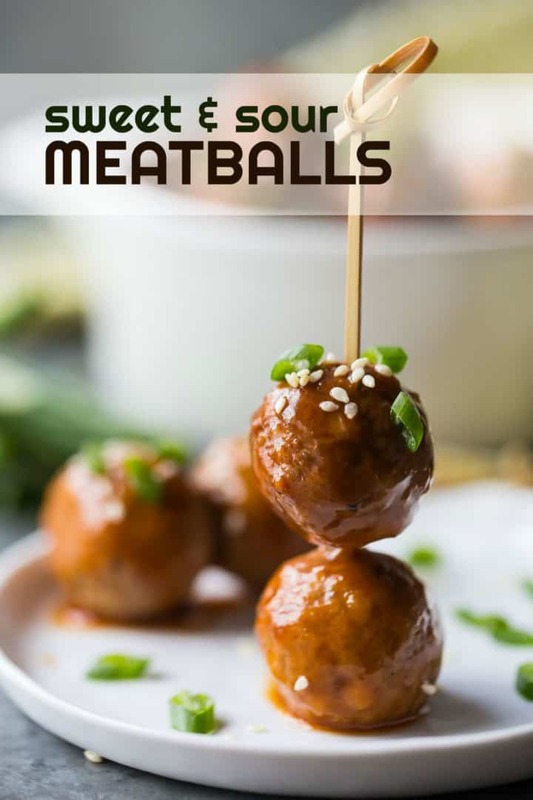 In a smaller bowl, whisk the brown sugar, vinegar, ketchup, soy sauce, crushed red pepper, and orange juice together, and pour it over the meatballs. About 30 minutes before serving, whisk the cornstarch and water together and stir into the sauce. Cover and continue to cook until the sauce has thickened. Garnish with sliced scallions and sesame seeds. Finally a sweet and sour sauce that doesn’t include pineapple. I’m deathly allergic to pineapple although I loved it before I discovered that, and that pineapple sweetens a whole bunch of things – sometimes in disquise labeled “natural sweeteners”. I can’t wait to try these. I imagine the sauce can be used with chicken and beef as well. Sounds great Melissa! Hope you enjoy! explain. The sauce is right up my flavor taste bud’s alley too. Great directions as usual. Me too Carol. So happy you like the recipe!